This Saturday, we had a busy day planned and so in an effort to alleviate the dinnertime rush, I made dinner in the morning. Hubby requested this dish earlier in the week so I love when I don’t have to plan what to eat, just go on my way to cooking! I made a different kind of topping this time and I really like how it came out! I buzzed the tortilla chips in a food processor for 2 seconds and added 2 TBL of melted butter and a small handful of cilantro. I nixed the cooking spray this time around and thought the topping was much better! And the cilantro added a greenish tint to the chips. Everything else was the same, chicken, rice, jalapenos, etc. I baked it at 400 degrees for an hour covered and then took off the foil for 15 minutes. Everyone gobbled it up! 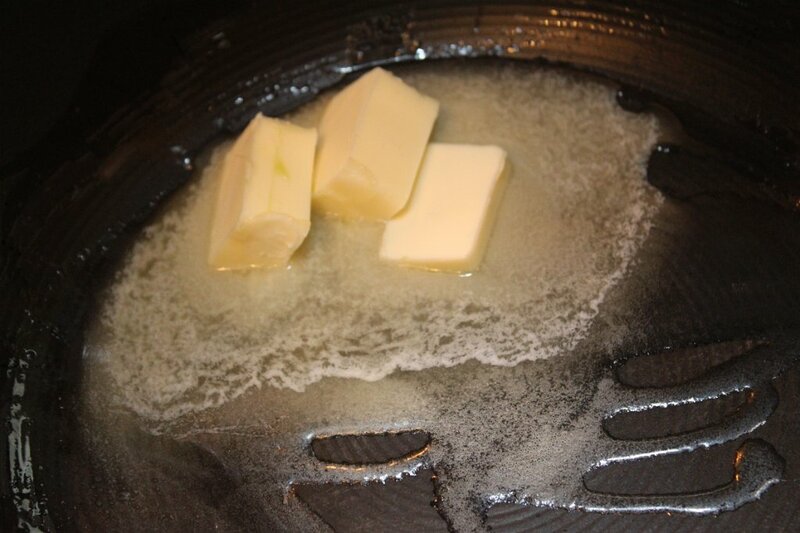 Melt butter in a large pot (with a lid) over medium high heat. 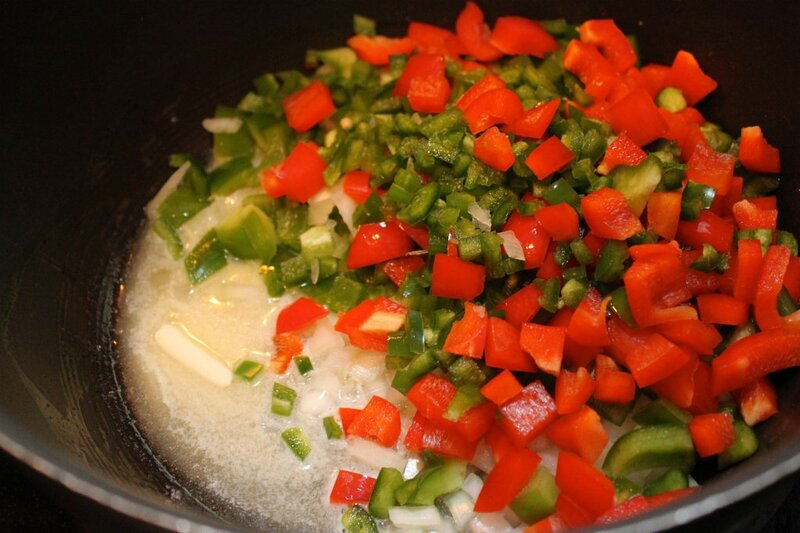 Add bell peppers, onion, jalapenos and salt. Cook until soft, about 10 minutes. Stir in garlic and cumin and warm through, about 30 seconds. Add in flour and stir constantly for about 1 minute, until slightly browned. Whisk in broth and cream, stirring slowly to incorporate. 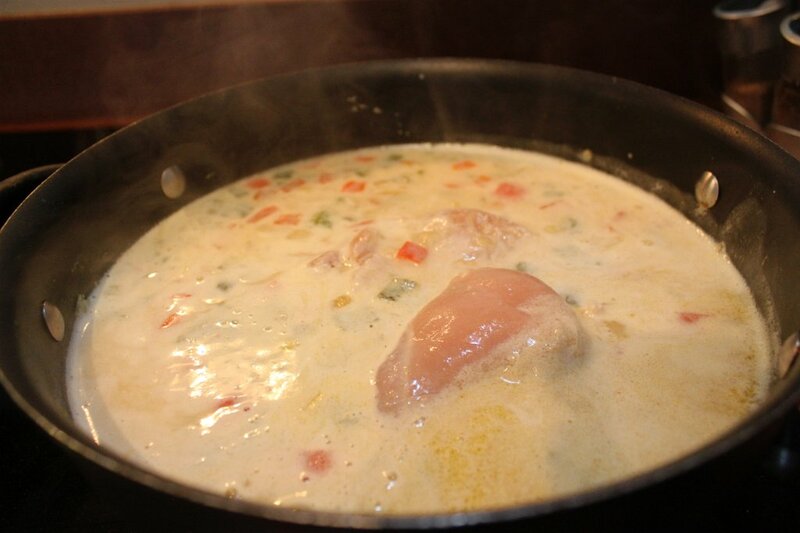 Add the chicken breasts, cover and bring to a simmer. 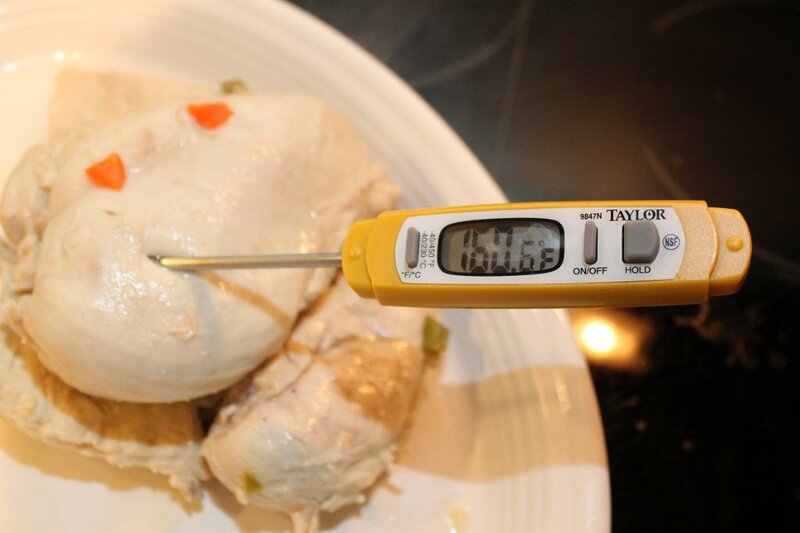 Reduce heat to low and cook until chicken is cooked completely or thermometer reads 160 degrees, about 15-18 minutes. 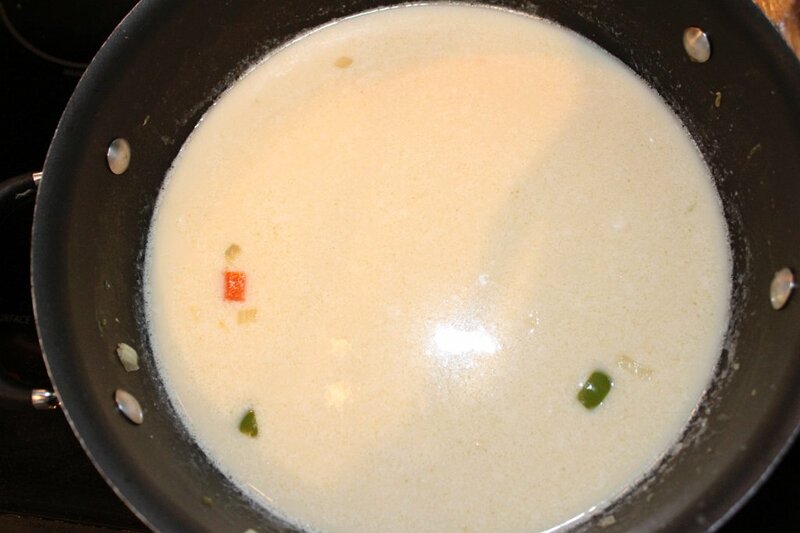 Remove chicken to cool and add rice to broth mixture. 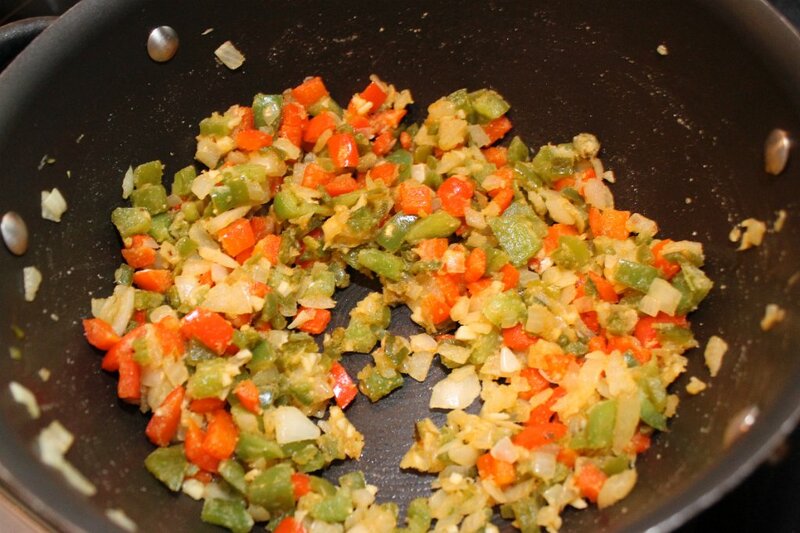 Stirring often, cover rice and cook until cooked, about 22 minutes. Shred chicken when cooled enough to handle. 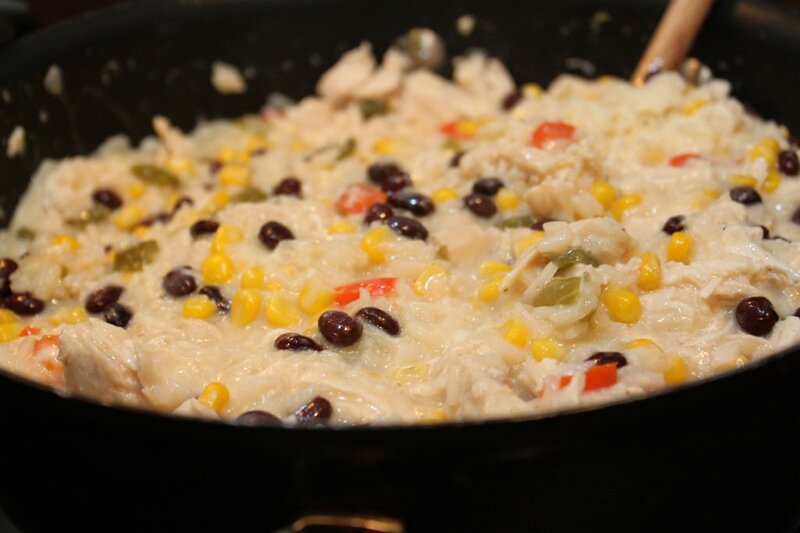 Remove pan from heat and stir in following ingredients: shredded chicken, grated cheese, drained black beans, corn and lime juice. Season with salt and pepper. Pour into a 13 x 9 dish. Spread out the crushed tortilla chips on top of mixture. Spray with cooking spray all over top. Cover with foil. Place in 400 degree oven for 45-60 minutes until bubbling. 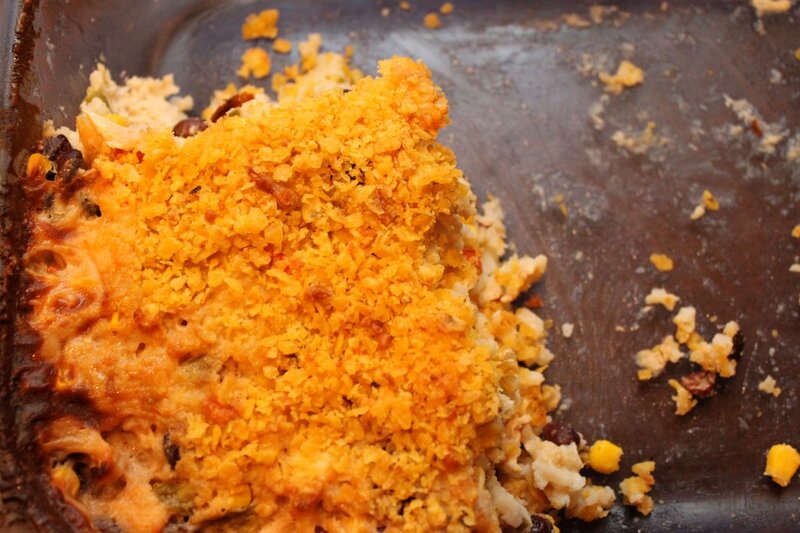 Remove foil and bake until crumbs are crisp, 15-20 minutes. 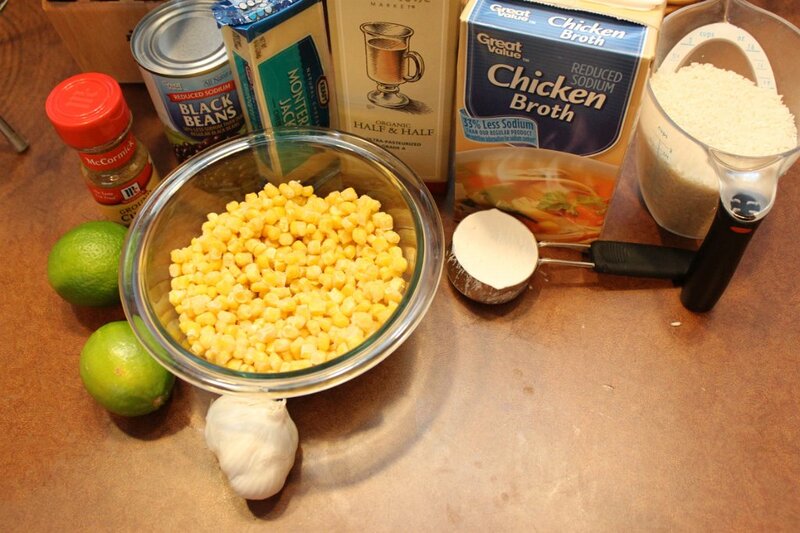 This makes a huge amount of food and its really great leftover! If you have a small crowd, I would recommend freezing half or double it and freeze. Just thaw in the refrigerator for 24 hours and bake as above. 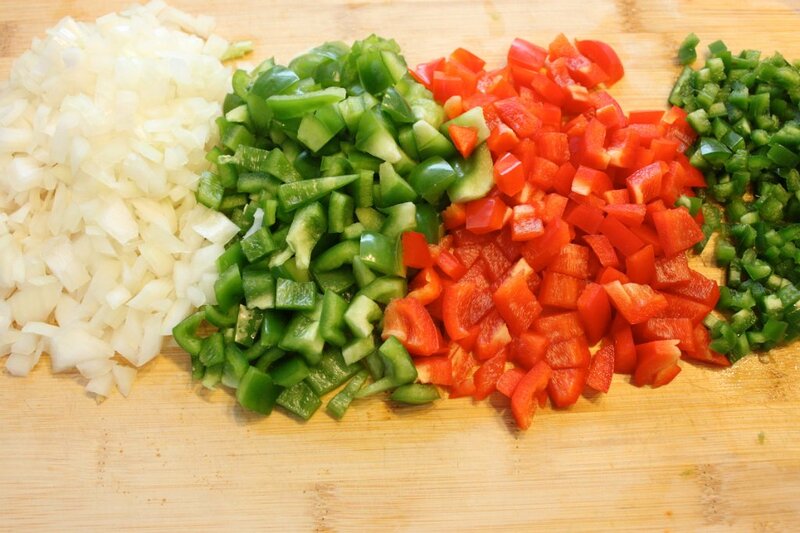 While this dish has a little prep time, the end result is totally worth it! This can be frozen and defrosted overnight in the fridge. Bake as above after defrosted. 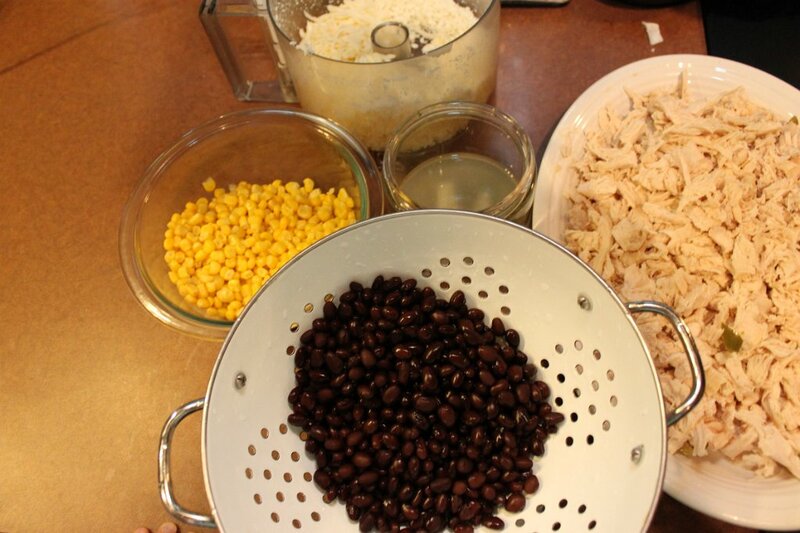 Please let me know what you think about the Black Bean Chicken and Rice. I would love to hear any and all comments! 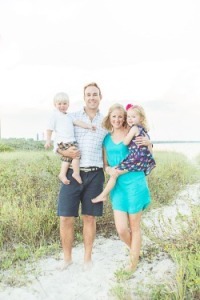 I’ve been pretty neglectful of my blog the past week but its been a hectic week! There are some great posts I have waiting for me to write! If only I could blog instead of sleep, I would get everything done I wanted! HA! This chicken and rice dish has been in my back pocket (not literally…) since we had some good friends over for dinner after Thanksgiving. I wanted to make something that was pretty far removed from stuffing and turkey and the like. 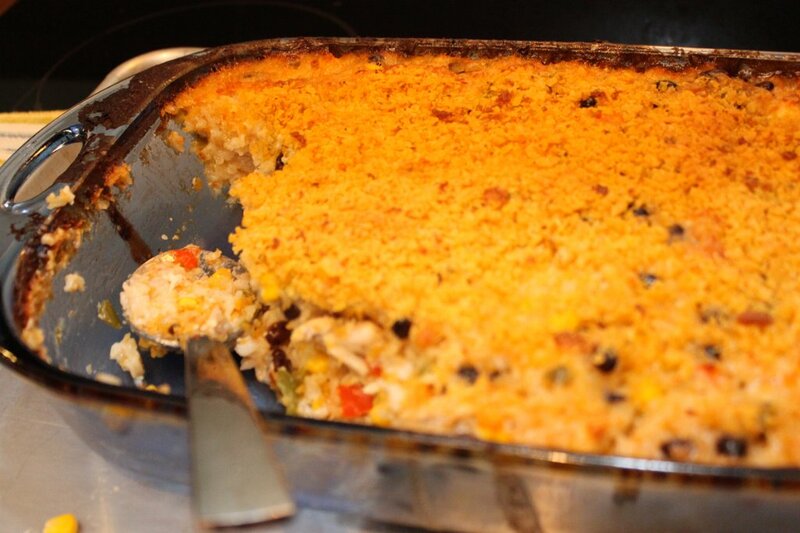 This really hit the spot with the fresh peppers and corn and creamy rice. They brought over a really delicious salad to go with and we had a great meal! 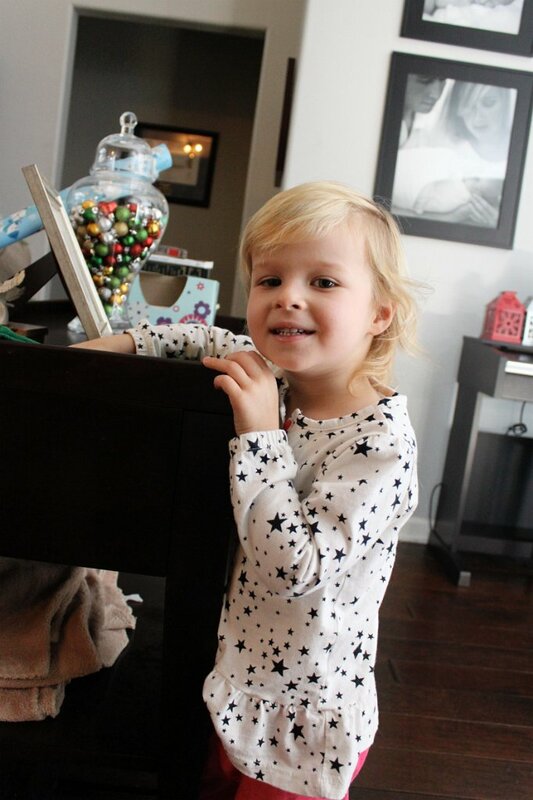 Luckily I had an excellent helper to make it more fun! Add the chicken breast, cover and bring to a simmer.